FILE - U.S. President Barack Obama, right, greets President-elect Donald Trump at inauguration ceremonies swearing in Trump as president on the West front of the U.S. Capitol in Washington, Jan. 20, 2017. Former U.S. President Barack Obama advised his successor before leaving office to push for greater Chinese support to rein in North Korea's nuclear ambitions, according to a senior Obama administration official familiar with the subject. During a private meeting near the end of his tenure, Obama stressed the need to address North Korea's nuclear and missile threats as an early priority, and encouraged then President-elect Donald Trump to carry on a strategy of ratcheting up pressure both on North Korea and its ally China, Jon Wolfsthal told VOA Tuesday. Wolfsthal served until recently as Obama's special assistant and senior director at the National Security Council for arms control and nonproliferation. “Making it clear to China that their continued protection of North Korea was beginning to undermine American security interests and that we would increasingly have to take steps to protect our interests in a way that might undermine China's own security was a strategy that we believed was going to bear fruit,” said Wolfsthal who is now affiliated with the Carnegie Endowment for International Peace. According to Wolfsthal, the Obama team presented two options to Trump for dealing with the North Korean threat: seek a freeze on North Korea's nuclear and missile programs through direct engagement, and increase pressure on North Korea through China. VOA has asked the National Security Council for a summary of the new administration's position on North Korea, but has not yet received a reply. 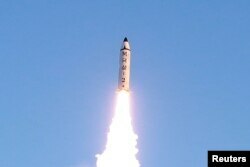 FILE - A view of the test-fire of a Pukguksong-2 missile, Feb. 13, 2017. The Obama administration advised against the first option, trying to freeze Pyongyang's weapons program, because that would leave North Korea with the nuclear warheads it already possesses. And de-facto acceptance of North Korea as a nuclear weapons state likely would prompt neighboring countries to seek their own nuclear weapons. Instead, Obama's team suggested the Trump administration step up pressure on Beijing to curb Pyongyang's nuclear and missile development. Whether the Trump administration will take its predecessors' advice and keep intact the policy it inherited remains unclear. Citing a U.S. official, Reuters reported earlier this month that Trump's team is exploring a full range of options, including ramping up pressure on China, in a response to the North's missile test. 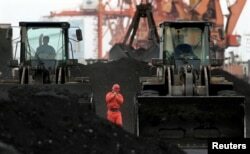 FILE - An employee walks between front-end loaders which are used to move coal imported from North Korea at Dandong port in the Chinese border city of Dandong, Dec. 7, 2010. In a public notice issued on Saturday, China's Ministry of Commerce said it has decided to cut off imports of North Korean coal for the remainder of 2017 as part of implementation of a U.N. Security Council resolution that was adopted last November. North Korea's coal exports, mostly to China, generate over $1 billion in revenue for the country annually and account for about a third of all export income, the U.S. government estimated last September. China's move was seen by some experts as a response to U.S. pressure. Stephan Haggard, a visiting fellow at the Peterson Institute for International Economics in Washington said China's coal ban, when fully implemented, could easily bring on “a full-blown balance of payments crisis” in North Korea. 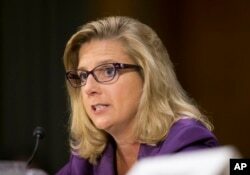 FILE - Defense Undersecretary Christine E. Wormuth testifies on Capitol Hill in Washington, Sept. 16, 2015. Christine Wormuth, the Pentagon's top policy official in the Obama administration, called for a policy of engagement and pressure, saying pressuring China alone has its limits, given Beijing's waning influence on Pyongyang. The ties between the two allies became strained after North Korean leader Kim Jong Un took power in 2011. In an apparent consolatory gesture, the Obama administration extended humanitarian assistance worth $1 million to the reclusive North Korean regime, through UNICEF, on the day before President Trump took over the White House last month. It was the first direct U.S. aid to the North in six years. Wolfsthal said the aid was intended not only to respond to genuine humanitarian needs, but also to ease tensions with the communist state during the transition of governments in the United States. “The hope was that by providing aid to the North, we could increase the leverage, or the very least the opportunity for the new team to try and pursue an effective policy with the North, should they choose to do so," Wolfsthal said. 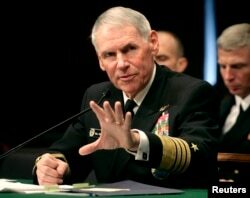 FILE - Navy Adm. William Fallon testifies before the Senate Armed Services Committee on Capitol Hill in Washington during a hearing on his nomination to be commander of the US Centeral Command Jan. 30, 2007. North Korea test-fired what it said was a new type of solid-fuel intermediate-range ballistic missile last week, its first missile test since Trump took office on January 20. Earlier this year, the North boasted that it was capable of launching a nuclear-tipped intercontinental ballistic missile — a rocket powerful enough to reach the United States — at any time, from any location, but that claim was greeted with great skepticism across the Pacific. In an interview with VOA, retired U.S. Navy Admiral William Fallon warned of Pyongyang's unpredictable provocations. Baik Sungwon of VOA's Korean Service contributed to this report. Will North Korea Stop its Weapons Program?